Jennifer Kostick– Jennifer Kostick is an author and speaker who teaches women how to activate their life’s purpose through the study of Scripture. Jennifer knows more about grief and loss than she ever thought she would, but Jesus met her in the middle of fierce storms and held her tightly with an even fiercer love. In addition to her love of teaching the powerful truth of Scripture, Jennifer is married to Paul, her husband of twenty-five years, has three children, and a beautiful daughter-in-law! She is also a full-time seminary student… because you can never know too much about the Bible! 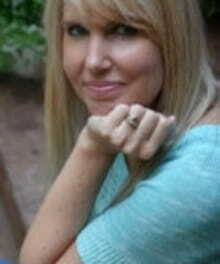 Jennifer blogs at www.Jenniferkostick.com and is passionate about encouraging women through a godly message of mercy and hope. Since January, I’ve been reading the book of Hebrews. Over and over again I read words from an unknown author who was willing to be used by the Holy Spirit to give life in the form of breathing, black and white words. Each sentence speaks to me. The book was probably written sometime around A.D. 64 and, yet, every time I read it I find something that grips me, refusing to let go. That’s a good thing, because I don’t want to let go of it either. Deep down inside the pit of grief I’ve faced over the last eight months, there is a well of bubbling hope. The movement is slow. It produces only what I need for the survival of each day, which I have to admit, has been frustrating, but underneath all that feels heavy and hard there is a consistent gentle and steady flow of everything I need to live my reality. Hebrews has been a source of hope for me, and has been faithful to confront me with tough questions to answer. There is more to the verse providing further evidence to the first part of the question, but these are the words refusing to leave my head each day. You see, my world was rocked in 2017 when I lost my brother and mother. There are days that even though I’ve been wide awake and smiling, that I’ve felt dead in slumber. But here’s the thing: there is more to my story than pain and loss. And friend, I don’t know what you’re facing, but I can tell you, only because I know grief intimately, that there is absolutely more to your story than whatever is staring you down at this very moment. We cannot escape grief or pain when we decide to escape Christ’s gift to us. Anger and bitterness from trauma sometimes leads to neglecting what was meant to restore us in times of trouble. I cannot afford to neglect so great a salvation because of grief that feels debilitating at times. I cannot afford to neglect so great a salvation just because I wish God would have written my story differently. And neither can you. Part of serving Jesus is trusting Him to turn my ashes into beauty even when I feel like I’m drowning from breathing the hot dust inside my lungs. I know that sounds harsh, but I believe in honesty and this is how my grief tends to feel. I have to be willing to let Him take my life and do as He pleases without being able to see or understand the big picture. And, I have to be willing to value my salvation. That means no one, not even the loss of those I love so much, can take precedence over all Christ has done for me. I won’t neglect His gift. We can try, all our days here on earth, to escape his salvation. However, it only leads to misery. I’m determined that my only escape will happen through Christ alone. I am dependent on my salvation. I am dependent on a God who says He knows best and will not leave me in the midst of the desert to suffer. I am dependent on a God who says I can walk through the valley of the shadow of death without fear. This road is not easy, and I’m nowhere near the end of dealing with my grief. However, every day I make it a practice to tap into the well of hope buried underneath all-consuming heartbreak. Please do not neglect your salvation. Instead, trust in it. Christ’s work on the cross is finished. It’s a job done, a free gift, and the most love you’ll ever receive. PS: My Instagram account is where I show how I’ve been finding grit inside grief. My handle is @jenniferkostick, just in case you want to see the new gift of hope God gave me just last weekend!!! I often use the hashtag #findinggritinsidegrief under my pictures. I would love to see how you’re finding grit. If you use the hashtag, #findinggritinsidegrief, on Instagram, you can share with me your process of gaining strength inside weak moments. I’d love to connect with you!